Anna Burns was awarded the Man Booker Prize in 2018 for her novel Milkman, which focuses on the experiences of a teenage girl in Northern Ireland in the 1970s. The first-person narrative is a chronicle of a tight-knit community in turbulent and often frightening times – managing to tell its story without ever naming the characters, the city or even the country where the action takes place, leaving the reader to unfold layers of ambiguity. Feminist Library volunteer Anna Pigott and London-based writer Catherine Madden shared some of their impressions of the book. 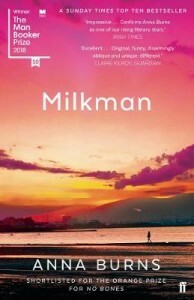 C: What were your initial impressions of Milkman? A: A huge thing for me which I really loved and thought was amazing was that they don’t name the place they’re in. C: The characters don’t have names. A: And they use euphemisms for everything. A: ‘That country over there.’ and they say ‘renouncers of the state’ instead of IRA. So there are layers of euphemisms which I thought was really good because it is the idea of it being so taboo that people don’t have the language to articulate what’s going on and I think that contributes to the sense of it being a stifling atmosphere. She even gets to the point where she won’t speak to people and you feel frustrated reading it because basically everyone has an assumption about her, which is not true, but she thinks if she says that it’s not true that it will seem even truer, so she doesn’t say anything at all. She doesn’t have the power to speak. C: It’s like she’s almost frozen because to do anything would encourage suspicion so she can’t do anything. She’s being watched all the time because of the place where she is and also she’s being policed because she’s a young woman. I agree with you that not naming the characters and place adds to the element of subterfuge and murkiness. Nobody quite knows what’s going on because you can’t be out in the open. And even the stuff like when there’s a tender queer moment between two characters. It’s all unspoken. Also, one of the things I liked about it is that it’s really, really funny. A: … Super maternal, Catholic. C: Yeah, and because the characters in the book don’t go to the hospital because if you go then you might get made to be an informer for the state, or people will think you have done anyway so you just don’t go to the hospital, all these ‘traditional women’ do their own medical interventions into things. And that’s a different kind of strength, matriarchal but not really. And then thinking about the ‘issue women’ who are the proto-feminists and everyone thinks they’re mad at first. A: They’re ostracised but then the IRA let them carry on. A: ..Man who is a high ranking figure in the IRA. C: She sees it as an intrusion but others see it as… She is seen speaking to him and that means that she is his mistress. A: But there’s nothing she can do. I like the bit at the beginning in the first section and she is running and he comes alongside her and forces her to stop running although he doesn’t physically touch her in any way. It’s just by being there he forces her, with the powers of social convention and the pressure of how you are supposed to behave, to stop. It’s like he restrained her from doing what she wanted to do and I think that’s an amazing metaphor. C: I read it quite slowly, much more slowly than I read other books. And actually when I went home at the weekend my mum was reading it and she said it was taking her ages and she’s a really fast reader as well. I think it is this thing of being trapped, and also being trapped in her head… you can’t move forward and there is a lack of freedom. Characters can’t tell each other things but also they can’t even have the top part of their mind telling the truth because they think that people are reading their minds all the time, so you have to push down what you actually think about things and have the top part of your mind thinking what you want people to think you think. A: So, what’s your conclusion? C: Give it a read. Stick with it, that’s what I would say. I was halfway through and I thought, you know what I’m going to stop this because I can’t be bothered, but then when it starts speeding up I thought, yes, yes, yes and it’s really worth it. A: I almost don’t want to bring it up but with Brexit – I don’t want to make it from a British perspective – but I think it’s important for people to remember the conflict. It’s good to get different nuanced perspectives on the day to day experiences of the Troubles. C: It’s completely within living memory. A: So, two thumbs up. C: What about four thumbs up? Because we’ve got four thumbs between us. Bloody good stuff.